Last week, the world woke up to yet another tragedy on the Mediterranean Sea, as nearly three hundred would be migrants including children died in rough seas in a bid to reach the Italian Island of Lampedusa. The repercussions from such massive loss of life on the high seas reverberate through several countries with calls for countries in the European Union to address problems in countries with high numbers of boat people and help curb the activities of traffickers on the high seas. 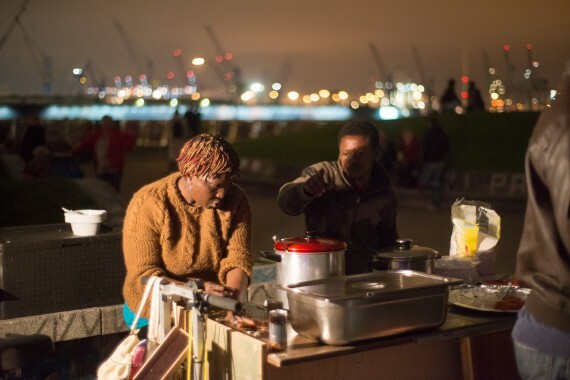 In Nima, a sprawling suburb of Accra, over thirty deaths have been recorded in the Sahara Desert and the Mediterranean Sea over the past several years as the youth embark on hazardous trips for a “better life in Europe”. Alarmed by the subtle rise in deaths of close friends and tales from survivors, Musah Swallah, a young issues driven artist and Nima resident, created a series of artworks on glass, canvass and wood to warm fellow residents and Ghanaians at large of the dangers that await them on such trips as well as the uncertainty of life on arrival in Europe as a refugee. Emotive works by Swallah employ the use of dramatic colours that help unfold the horrors of hazardous adventures by young men through the Sahara desert and “mountainous” waves of the Mediterranean Sea. Metaphors, symbols and exhausted human figures on overcrowded / unstable trucks as well as human skeletons that lie randomly in the desert provide the viewer with an imaginative insight into escapades that are uncertain, terrifying and ambiguous. Through a vast expanse of desert and the open sea, he creates images with faces that exhibit pain, aggression, despair and indifference. Indeed, the possibilities and consequences of this perilous journey hover over the viewer creating in the process unmistakable tension and apprehension. 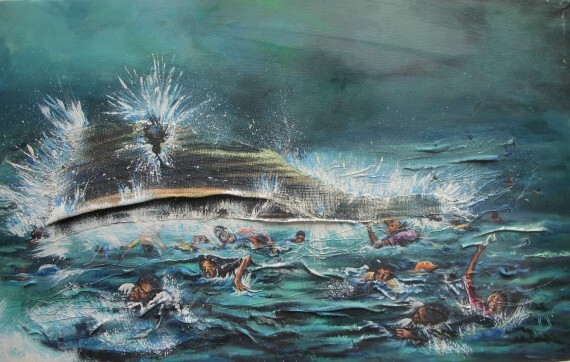 Although clearly referencing a problem in his neighborhood, Swallah’s work equally concern the whole of Ghana while reflecting universal concerns on a growing phenomenon that has resulted in thousands of deaths and over crowded reception centres on Lampedusa. 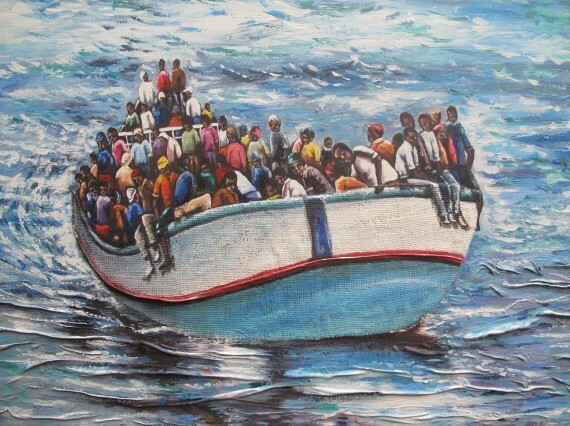 His paintings equally raise the issue of what awaits asylum seekers and refugees in Europe. These include long and indefinite stay in temporary shelters that are noted for its unsanitary and prison-like conditions, routine mistreatment of refugees and dehumanizing actions like spraying of chemicals on naked inmates in cold temperatures. Swallah’s work recalls that of German photographer Tobias Zielony, who has been selected for the German Pavilion at the 2015 edition of the Venice Biennial. 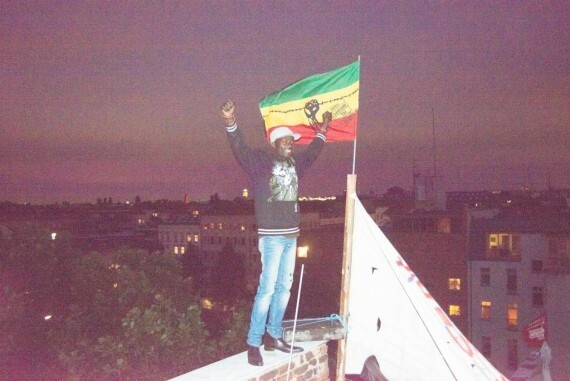 Indeed, his critical approach to social documentarism including vivid images of activism by Ghanaian and other refugees in Germany has made him one of the most discussed artists throughout the world. 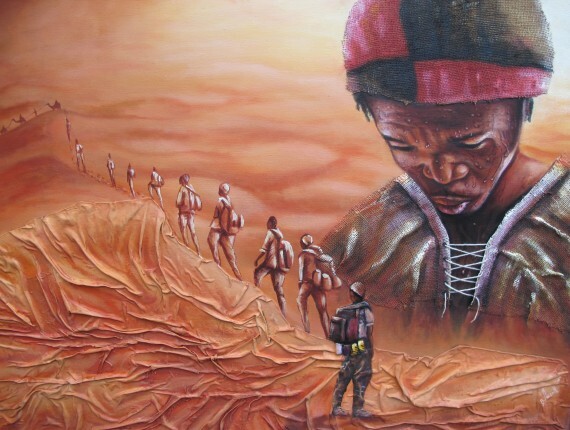 His paintings also raise issues of xenophobia and displacement as his paintings confront us with psychological and physical experiences of people who undertake a journey of life that has more often turned out to be one of death. 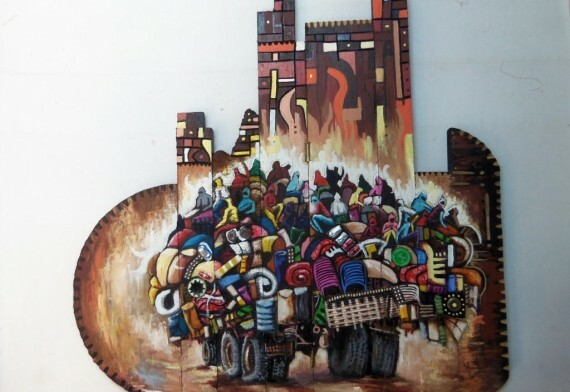 Titled “Migrations”, the paintings by Swallah, which also create anxiety as the viewer is trapped among gloomy images is scheduled to be displayed in a number of schools and institutions in Nima.